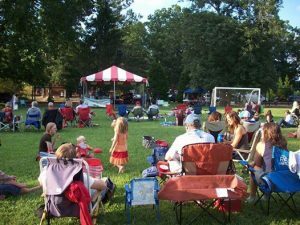 The 14h annual Groovin’ on Grovemont summer concert series returns to Grovemont Square (adjacent to the Swannanoa Library) on July 12, July 26 and August 9, at 6:00 p.m.
Bring a blanket or lawn chair and come enjoy these family-friendly evenings of great music! The concert series is free and open to the public. Concessions, including hot dogs and home-baked goods, are available for purchase. Proceeds benefit the Friends of the Swannanoa Library and the Swannanoa Community Council. 8/9/2016: The ‘Groovemont’ Players – This collection of Swannanoa Valley players represents a “who’s who” of Swannanoa Valley and regional talent, performing a mix of rock, soul, blues, and beyond. This will be an evening to remember, full of wonderful musical surprises. Bonus feature: GIANT HALF-PRICE BOOK SALE during each Groovin’, 5:00 – 8:30 p.m. at the Swannanoa Library, 101 West Charleston Avenue. Thousands of great books at unbelievably low prices! Individual and business sponsorship opportunities for Groovin’ on Grovemont are still available, and there are lots of volunteer opportunities, too. To inquire, call the library at 828-250-6486.